NASA's Swift spacecraft captured this view of the new supernova in galaxy M82 on Jan. 22, 2014. Mid-ultraviolet light is shown in blue, near-UV light in green, and visible light in red. Thick dust in M82 scatters much of the highest-energy light, which is why the supernova appears yellowish here. One of the closest star explosions in nearly 27 years was discovered this week by students and staff at the University of College London, and the supernova can be easily seen by stargazers equipped with a moderately large telescope. Early on the evening of Jan. 21, a team of students — Ben Cooke, Tom Wright, Matthew Wilde and Guy Pollack — assisted by astronomer Steve Fossey, spotted the new supernova in nearby galaxy Messier 82 (M82), popularly known as the "Cigar Galaxy." While the new supernova is not visible to the naked eye, it is visible in telescopes, weather permitting. It may also be visible through a good set of binoculars. Here's how to find the new supernova in galaxy M82, which has now been catalogued as supernova 2014J. These before and after shots of the Cigar Galaxy (M82) by amateur astronomer Fred Hermann illustrate the dramatic emergence of a new supernova. The image at left was captured on Nov. 28, 2013. The image at right was snapped on Jan. 22, 2014. To find M82, use the bowl of the Big Dipper. Extend a diagonal line from Phecda — the bottom left star in the bowl — up to the upper right star in the bowl, which is called Dubhe. Extending that line out at a similar distance between these two stars will bring you to the general vicinity of the two galaxies M82 and M81. M82 is positioned to the north of M81. Both galaxies were discovered by Johann Bode at Berlin in December 1774. To see the galaxies, you'll need a good, dark sky and good binoculars. But to get a really good view of the supernova, I would recommend a moderately large telescope. A 6-inch telescope at 150-power, or a 10-inch telescope at 250-power, should do just fine. The supernova is not in the central region the galaxy but is off to one side. Observers are reporting it at about magnitude 11.5 – about 100 times dimmer than the faintest star visible to the eye without optical aid, and whitish with a slight orange hue. Editor's Note: If you snap an amazing picture of the new star explosion, or any other night sky view that you'd like to share for a possible story or image gallery, send photos, comments and your name and location to managing editor Tariq Malik at spacephotos@space.com. This sky map shows the location of galaxy M82, the Cigar Galaxy, in relation to constellations in the January night sky as seen at 9 p.m. local time from mid-northern latitudes. The galaxy is home to a new supernova that was discovered on Jan. 21, 2014. The new supernova's discovery was actually an astronomical fluke. During the Jan. 21 observing session at the University College London's teaching observatory, Fossey noticed that clouds were rapidly increasing, so instead of giving his scheduled lecture on practical astronomy, he decided to give his students a quick demonstration on how to use the CCD camera on one of the observatory's automated telescopes. Messier 82 was chosen as a target and it was while adjusting the telescope that Fossey noticed a star that appeared overlaid on the galaxy — a star which he did not recognize from previous observations. Since sky conditions were rapidly deteriorating, the group took a rapid series of 1-minute and 2-minute exposures through different colored filters so that they could measure its brightness and color. In addition, to ensure the object was not an instrumental defect, a second telescope was aimed toward Messier 82 to confirm that the new star was real. One of Fossey's students, Tom Wright, later commented that, "One minute we're eating pizza then five minutes later we've helped to discover a supernova. I couldn't believe it. It reminds me why I got interested in astronomy in the first place." A supernova is, for all intents and purposes, a star that has suddenly burst apart. The greater part of the star's mass is converted instantly into radiant energy and the resultant explosion can be equal to the light of 100 billion normal stars. 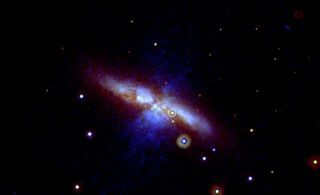 Messier 82 is roughly 12 million light-years away, so the star in question did not erupt on Jan. 21, but in reality the explosion actually took place approximately 12 million years ago. Galaxy M82 is a popular deep-sky object for amateur observers and researchers, appearing in telescopes as a cigar-shaped smear of light; hence the moniker, "Cigar Galaxy." Burnham's Celestial Handbook describes it as spindle-shaped." Nobody can say with certainty how bright the supernova 2014J, will ultimately get, but the best bet seems to suggest that it will maintain its current brightness, if not get a bit brighter through the next few weeks. Joe Rao serves as an instructor and guest lecturer at New York's Hayden Planetarium. He writes about astronomy for Natural History magazine, the Farmer's Almanac and other publications, and he is also an on-camera meteorologist for News 12 Westchester, N.Y. Follow us @Spacedotcom, Facebook or Google+. Original article on SPACE.com.